What goes in must come out! 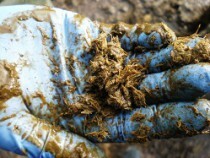 Assessing cow muck can be a useful management tool as dung consistency is a good indicator of what is happening in a cow's digestive system and how efficiently the ration is being used. Monitoring cow muck, alongside general animal health and production, is a useful way of identifying dietary and health problems on a herd scale. Since 1991 Kingshay has been publishing Farming Notes on issues critical to the success of a modern dairy farm business. These briefings provide dairy farmers, large animal vets, farm consultants and other interested parties with the most important and timely information in a concise two-page format. The information contained in our Farming Notes is written and updated by our experts to ensure accuracy and save you time. A selection of Farming Notes are available to buy individually from our online shop. To gain access to all our Farming Notes become a Kingshay member.